Where I’ve Been and some past NOTD’s!!! Hi all!!! Phew… Sorry for my hiatus. I’ve been pretty sick the past 2 weeks and am still trying to get over whatever this is. I’ve not been doing very many manicures because I’ve been too exhausted/tired from coughing like crazy. My whole body is sore from it! My Dr. said I didn’t have pneumonia or bronchitis (she listened to my chest) but she prescribed me antibiotics to prevent anything from getting worse. After looking online and studying about bronchitis and pneumonia I’ve learned that antibiotics don’t help bronchitis but they do pneumonia. I don’t have a fever or anything… just a cough that produces a ton of mucus and makes it really hard to breathe. Anywho… I done a little bit of nail-art and manicures throughout my sickness so I figured I would share them! Check them out below! As you can tell.. my nails are round now. I just find them easier to deal with than squares. 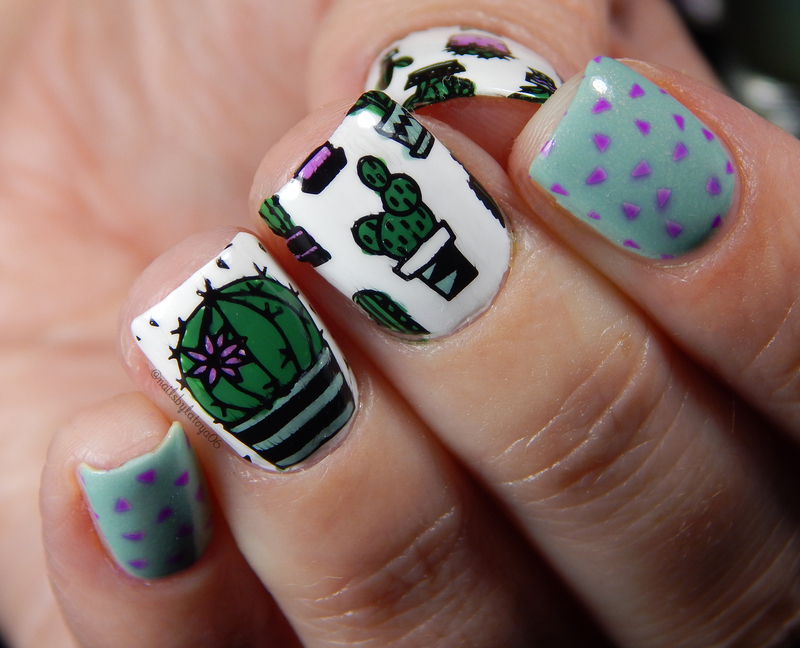 For the first look I shared (the cacti one) I used MoYou Hipster 16 stamping plate, and Pahlish Unwound Future and Snapdragon. The second photo is Pahlish Pompadour, and the last picture is a colorblock manicure I done yesterday (or the day before yesterday) with Cirque Storm King, China Glaze Make an Entrance, and Salon Perfect Nine Lives. I hope you enjoyed this post!!! Stay tuned tomorrow, I have a new MoYou London stamping plate I’m going to play with tonight and I’ll share the nail-art with you all once it’s done! This entry was posted in Beauty, Nail Art and tagged beauty, blog, makeup, Nail art, update. Bookmark the permalink.